BusinessFit executives, David White and Charles Henzi, made their third trip (in less than a year) to London in August 2018. They have come back enthusing about the business opportunities that have been uncovered with the help of their new United Kingdom (UK) partner, Mike Miller. A seasoned corporate business leader and entrepreneur in both South Africa and the UK, Miller has undertaken to be the BusinessFit UK partner. The carefully selected contacts were seen in the following order from 21st to 24th August. South African CEO of Codex Capital and an active member of the SA Chamber of Commerce UK EXCO and business ambassador. Previously with the SADTI in London, he worked with Miller on the original formation of the South African Chamber in London. Cannavo was very enthusiastic at the prospect of working as part of the UK BusinessFit team and is having follow up discussions with Miller to plan the way forward. Treasurer of the South African Chamber of Commerce UK and CEO of Inyati Consulting specialising in commercial, financial and operational management. He too was very enthusiastic at the prospect of working as part of the UK BusinessFit team and has already had follow up discussions with Miller. Executive director (UK) Nelson Mandela Children's Fund (NMCF). Miller masterminded the Miracles for Kids campaign that raised R3 million during his corporate career twenty years ago in South Africa and since he arrived in the UK to set up The South African Shop franchise in the UK in 1999, he has worked with Scott on initiatives to raise funds for the NMCF in the UK. 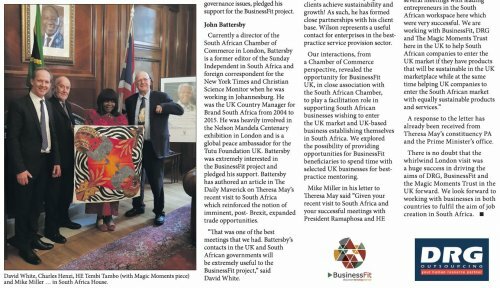 Director of the South African Chamber of Commerce in London, based in Yorkshire, has pledged his support for the BusinessFit initiative. Her Excellency Tembi Tambo, South African High Commissioner to Her Majesty Queen Elizabeth's government. Tambo was briefed on BusinessFit objectives, methodology, achievements and aspirations. This information was received enthusiastically, with an undertaking to make mention to President Ramaphosa whom she was meeting during the course of the UK Prime Minister's visit to South Africa. Mention of BusinessFit letter to President Ramaphosa on the BusinessFit employment creation model and his reference to it in a parliamentary address was made. Upon being presented with a Magic Moments Trust item ( a fabric painted artwork produced by members of a disadvantaged, rural community in KwaZulu-Natal), Tambo immediately proposed that, as part of a Freedom Day event planned for 27 April 2019 at South Africa House, London, that a group of the artists be invited to demonstrate their skills to and collaborate with young UK artists. In the meantime she undertook to create a display of the Magic Moments Trust products in the High Commission. Tambo said that this was the best meeting that she had had since arriving in London to take up her new role four months ago. On the back of that Miller wrote to British Prime Minister Theresa May whom he'd met on several occasions as president of the Maidenhead Chamber of Chamber of Commerce. He outlined the BusinessFit initiative and demonstrated how it could foster new trading opportunities between the two countries. Previously CEO of the South African Chamber and now involved in educating disadvantaged black children in London. The meeting was via Skype. Butler, who is also involved in advising mining companies in South Africa on security and governance issues, pledged his support for the BusinessFit project. Currently a director of the South African Chamber of Commerce in London, Battersby is a former editor of the Sunday Independent in South Africa and foreign correspondent for the New York Times and Christian Science Monitor when he was working in Johannesburg. He was the UK Country Manager for Brand South Africa from 2004 to 2015. He was heavily involved in the Nelson Mandela Centenary exhibition in London and is a global peace ambassador for the Tutu Foundation UK. Battersby was extremely interested in the BusinessFit project and pledged his support. Battersby has authored an article in The Daily Maverick on Theresa May's recent visit to South Africa which reinforced the notion of imminent, post- Brexit, expanded trade opportunities. "That was one of the best meetings that we had. Battersby's contacts in the UK and South African governments will be extremely useful to the BusinessFit project," said David White. CEO Valufin (Forex service provider) and Genius Methods in the UK. Constanςon is also the chair of the South African Chamber of Commerce UK. She was most impressed with the BusinessFit project and its forward thinking plans and pledged the support of the South African Chamber in realising the project's aims. She enthusiastically approved of BusinessFit's desire to be appointed to the Chamber's EXCO team in South Africa, which was agreed in principle. Previously CFO of an AE&CI subsidiary in South Africa, he is now CEO of Thames Bridge in Maidenhead who are accountants to the Maidenhead Chamber of Commerce and to Miller's company, SAJE international Ltd. The meeting was followed up by Miller a few days later to answer any queries that Platt had and he too pledged his support for the project. Chairman of Wilson Partners providing accounting, tax and advisory Services. Ross is a fellow of the Institute of Directors (IOD) and a past chair of the IOD in Berkshire. Wilson is now an IOD ambassador. He impressed us with a philosophy of providing services 'beyond the profession', i.e. helping clients achieve sustainability and growth! As such, he has formed close partnerships with his client base. Wilson represents a useful contact for enterprises in the bestpractice service provision sector. Our interactions, from a Chamber of Commerce perspective, revealed the opportunity for BusinessFit UK, in close association with the South African Chamber, to play a facilitation role in supporting South African businesses wishing to enter the UK market and UK-based business establishing themselves in South Africa. We explored the possibility of providing opportunities for BusinessFit beneficiaries to spend time with selected UK businesses for bestpractice mentoring. Mike Miller in his letter to Theresa May said "Given your recent visit to South Africa and your successful meetings with President Ramaphosa and HE Tembi Tambo, South African High Commissioner to Her Majesty's government, I felt it opportune to write to you to outline the work that the South African Chamber UK and its associates, DRG, BusinessFit and the Magic Moments Trust in South Africa are doing for sustainable entrepreneur development and job creation. David White and Charles Henzi, senior executives from Business Fit and DRG spent last week in the UK and I arranged several meetings with leading entrepreneurs in the South African workspace here which were very successful. We are working with BusinessFit, DRG and The Magic Moments Trust here in the UK to help South African companies to enter the UK market if they have products that will be sustainable in the UK marketplace while at the same time helping UK companies to enter the South African market with equally sustainable products and services." A response to the letter has already been received from Theresa May's constituency PA and the Prime Minister's office. There is no doubt that the whirlwind London visit was a huge success in driving the aims of DRG, BusinessFit and the Magic Moments Trust in the UK forward. We look forward to working with businesses in both countries to fulfil the aim of job creation in South Africa.